16953-SS-DST is rated 4.2 out of 5 by 164. Delta's exclusive DIAMOND Seal® Technology uses a valve with a tough diamond coating. InnoFlex® PEX waterways keep water inside the faucet out of contact with potential metal contaminants. This powerful combination brings you a faucet built to last up to five million uses. 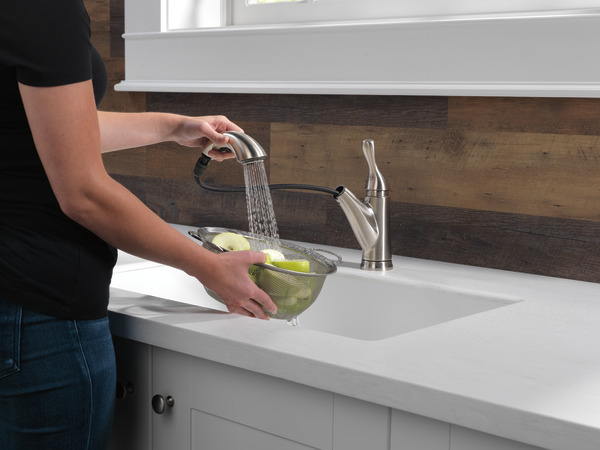 Only Delta faucets are equipped with Touch-Clean® soft, rubber nubbins that allow you to easily wipe away calcium and lime build-up with the touch of a finger. The included escutcheon completes the ensemble for a more finished look. 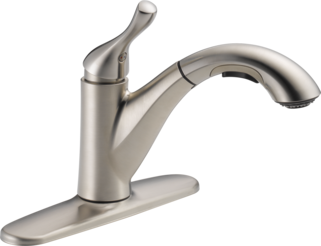 Rated 5 out of 5 by DrSteve from Nice Faucet I bought this faucet from Home Depot a couple of weeks ago and had it installed professionally. 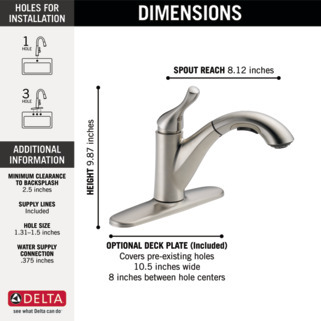 My brother-in-law, who happens to be a plumber had recommended a Delta faucet. My wife and I are happy with it so far. It looks nice, was a decent price and works well so far. 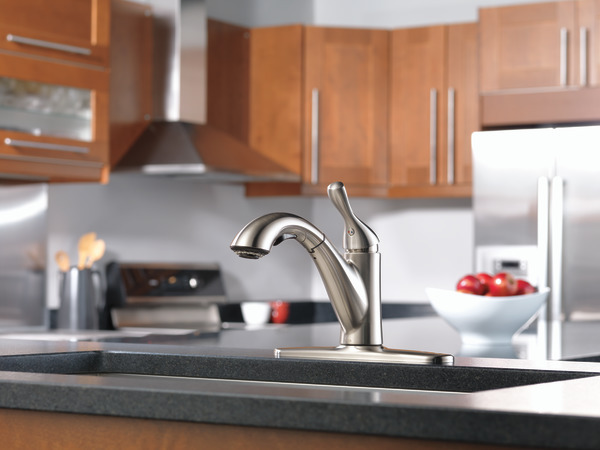 Rated 5 out of 5 by ChrisfromLI from Grant Stainless Finish Kitchen Faucet This faucet replaced a now discontinued Signature kitchen faucet which lasted about13 years. 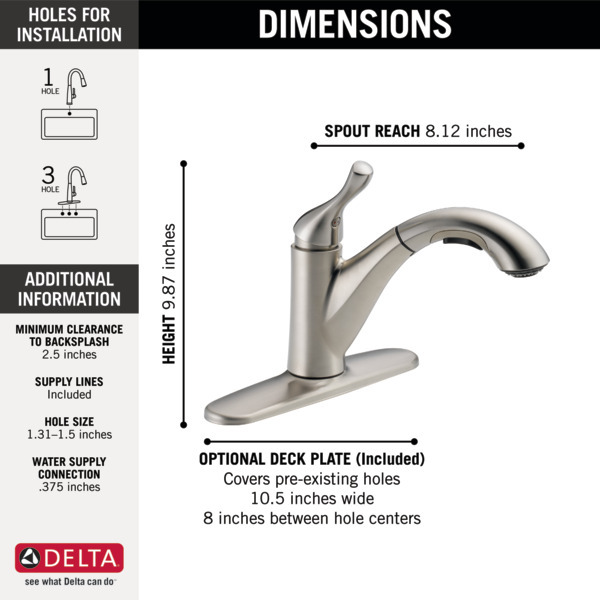 This Single hole installation faucet swivels much easier than the old faucet. We like the below the pull out spout toggle that allows one to switch from stream to spray. The older model was a push to change the stream to spray. The older model had a crummy hot/cold disc on the faucet, the new one is a stainless disc that blends in with the stainless finish. 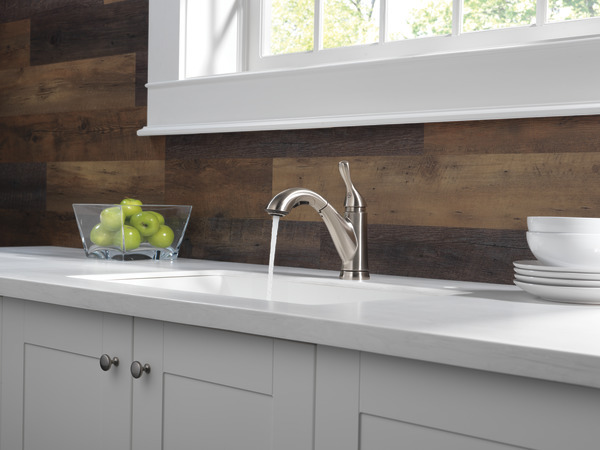 The stainless finish doesn’t get watermarks & wipes clean. The best part is the redesign of the hose attaching to the pull out spout. Instead of screwing in the plastic tip of the hose to the brass part, this plastic sort of twists into a locked plastic tip emerging from the spout. It looks like it won’t separate over time with the screw being stripped so to speak. The pull out spout is much lighter in heftiness from the older spout. The only thing I would change on this faucet is make the pull out spout longer and not as curved as this one is. My D shaped stainless steel sink would appreciate that. This faucet was purchased from Home Depot & my plumber had no problems installing it. Rated 5 out of 5 by djdelta from It is a nice look and easily installed. It is truly a nice look and easily installed. The package includes all needs to replace the old one. The best part is it is life-time warranty. 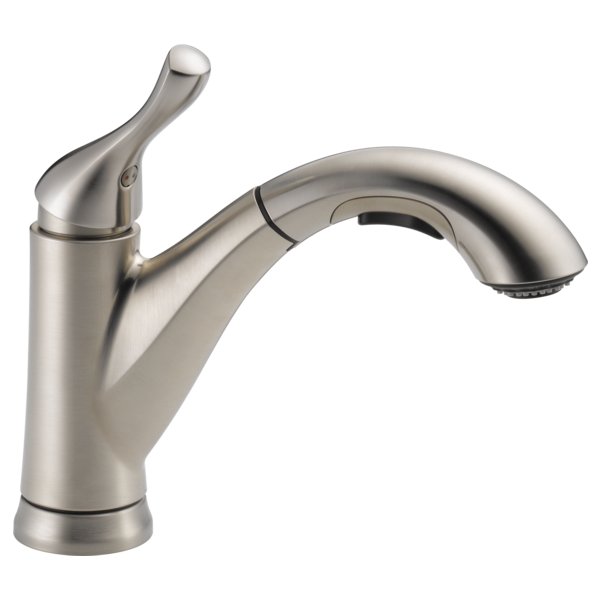 Rated 5 out of 5 by Lin5144 from Nice looking faucet Had it installed just a few days ago. So far, so good. Where is the screen to clean build up of minerals? How to replace parts RP50587 &amp; RP50587 ? How difficult is it to replace the valve assembly if the unit leaks? I've found it difficult to replace the cartridge in single lever faucets. 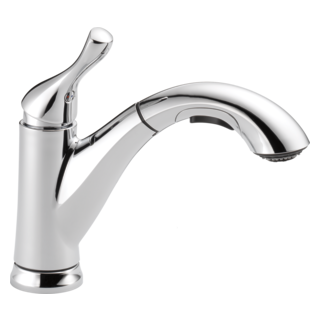 Has anyone ever replaced parts that cause the faucet to leak? What is your experience? How do I attach the wand to the hose? What is this faucet made of? Is it plastic or metal? I have a double sink - divider in middle. 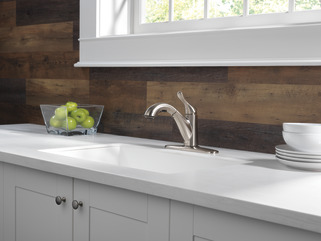 Does this model swivel between sinks and if not, which one does. Yes, it swivels between the 2 sinks. I also have a double sink. It works good. Where can I get the tool to remove the handle?